This is an overview of how a user can forward their email to another email account. Issue: User wants to forward their emails to another email account. 1. Login to the OWA website. Office365.siue.edu. 2. In the upper right hand click on the Settings icon, looks like a cog. 3. 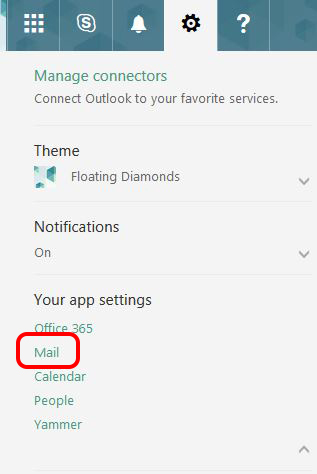 Choose Mail, listed under Your App Settings. 4. In the left column, extend mail, then extend accounts. Select Forwarding. 5. Click on the Start Forwarding radial button. and enter the email address where you want to forward your email to. 6. To Keep a copy option is really up to you. If you wish to keep a copy in your SIUE account leave it checked. If you uncheck the box, it will not keep an email in your SIUE account.